As surprisingly as it seems, a mechanical engineer invented the first slot machine in 1895. 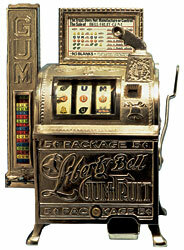 It was called the Liberty Bell Slot Machine, and we can say that it helped in the developing of the first casinos. Of course, it was only an old fashioned 3-reel, 1 payline slot machine, but it surely created a revolution back then. However, the symbols were attractive, and you can still play the online version of this legendary slots machine in some online casinos. The machine was also designed on a primitive system; therefore, the player had some serious chances to win on this device. The maximum payout was 50 cents. Don't laugh! The history of pokies can be sometimes funny. That was an important sum back then, as the minimum bet was 1 cent, and a dollar was considered an important sum of money. If you are passionate about the history of casinos, you can still find the original machine in the Liberty Saloon in Nevada. Charles Fey (the mechanical engineer we were talking about) also developed some other pokies machines, so he can be considered the father of slots machines. He also managed to solve some other problems connected with those machines, such as the fake nickels inserted in the device by scammers. He is also the inventor of the casino franchise, as he rented the machines to the casinos for a profit share. After a while, Liberty Bell was requested all over America. Unfortunately for him, Fey was not able to exploit this interest. The competition appeared soon, as an investor from Chicago developed the Operator Bell, a performing machine for that time that introduced fruit symbols on the reels. The name "reels" comes from the inside mechanisms of the machine. The hoops used to drive the coins into their respective slots were called reels. Today, the machines are distinguished one from another with this term, as you can find advanced online pokies having 5 or even more reels. The payout was made in coinage, and there were many cases when winners complained about not getting the deserved payout. Today, an online casino that is not offering slots machines is unconceivable. Moreover, you can find hundreds of sites offering only online pokies machines. Poker is trying to challenge the position of "most popular online game", but we are confident that pokies games will keep this position for a long time in the online world.